Saros cycle 138, repeating every 18 years, 11 days, containing 70 events. 16 of these are partial solar eclipses. It is a part of Saros cycle 138, repeating every 18 years, 11 days, containing 70 events. The series started with partial solar eclipse on June 6, 1472. It contains annular eclipses from August 31, 1598 through February 18, 2482 with a hybrid eclipse on March 1, 2500. It has total eclipses from March 12, 2518 through April 3, 2554. The series ends at member 70 as a partial eclipse on July 11, 2716. 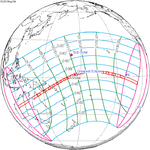 The longest duration of totality will be only 56 seconds on April 3, 2554. Umbral eclipses (annular, total and hybrid) can be further classified as either: 1) Central (two limits), 2) Central (one limit) or 3) Non-Central (one limit). The statistical distribution of these classes in Saros series 138 appears in the following table. This page was last edited on 18 April 2019, at 00:04 (UTC).